Nearly 20,000 dock workers went on a 24-hour strike on March 23 across the nation. The union demanded a wage hike and other system improvement, but the companies rejected all demands saying that the union should hold enterprise-based negotiations for wage hikes and calling that the spring offensive out of date. 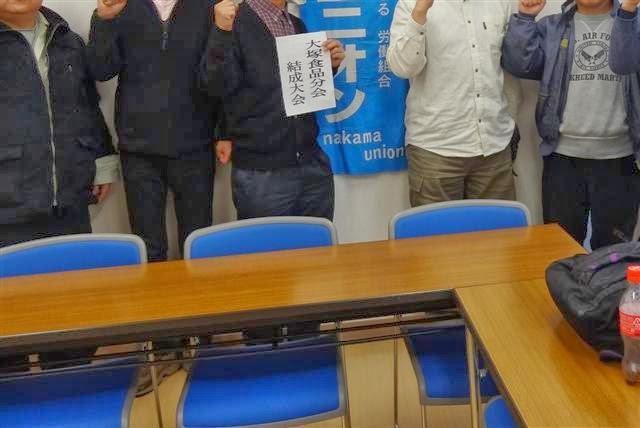 Japanese unions, which are usually enterprise-based, demand a wage hike for base salary every spring because that's the beginning of fiscal year in Japan. 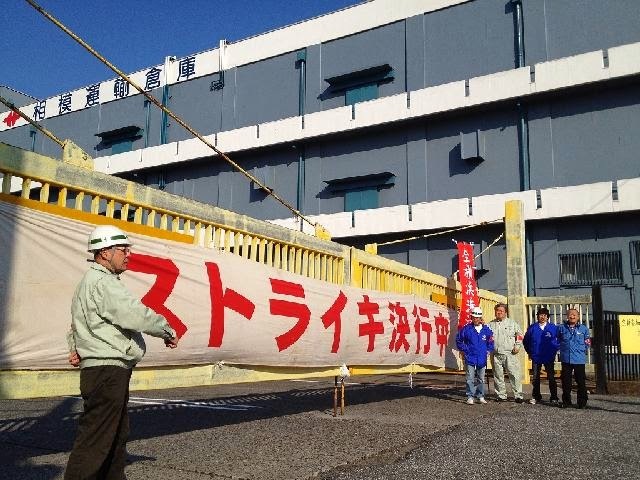 "They are mocking us," says the general-secretary of All Japan Dock Workers Union Yokohama branch. "There is nothing but a struggle for workers' rights." No trucks were transporting, no freight ships coming into ports, or no gantry cranes were operating during the strike at Yokohama docks. The union also plans to go on a strike again at the month end if the management does not compromise, the union says. During this year's spring offensive, workers at private railaway companies and postal workers' unions also went on strike. The six-month long campaign to denounce discrimination against Korean schools climaxed on March 9 at an event called, “Defend Our Schools! Korean College Students’ Nationwide Gathering to Oppose Discrimination against Korean Schools,” in Tokyo. 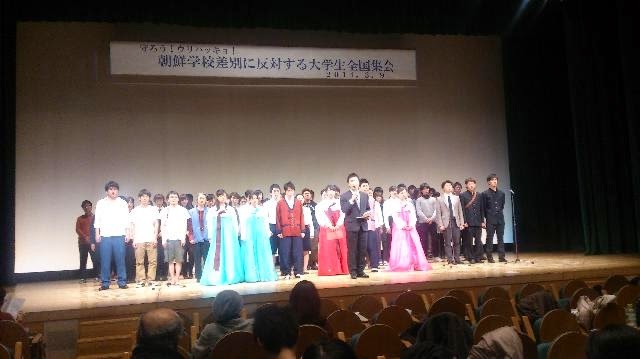 The campaign, which set off last October by Korean college students in Japan, was aimed at introducing Korean schools to more people and providing an opportunity to think about discrimination against Korean schools, as well as inviting support and raising their voices against discrimination. 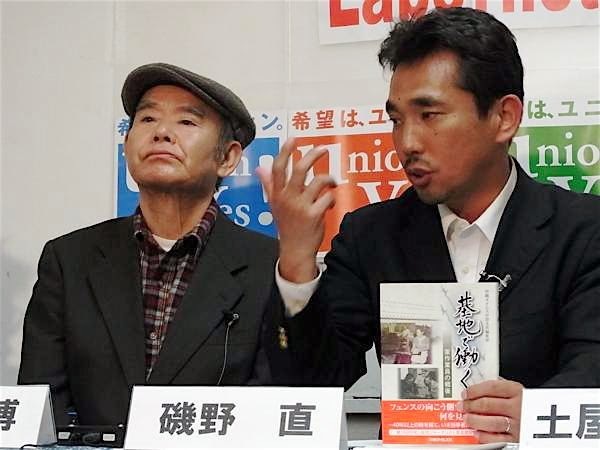 CHONG Yong-Hwan, associate professor of Meiji Gakuin University, and FUJINAGA Takeshi, professor of Osaka Sangyo University spoke at a symposium about discrimination against Korean schools and Japan’s colonialism. Hello everyone, today I am graduating from high school. After careful deliberation, I decided to refuse to sing the national anthem at the commencement we are going to attend, where all are supposed to stand up and sing. I am very pleased if you listen to my voice. It has been my resolution not to sing the anthem at commencement ceremony since I was a middle-school student. I must add that it was from my own will, and I was not advised to by my parents nor by anybody else. Until the day before the ceremony at the middle school three years ago, I had been bothered and worried over whether or not I should remain seated instead of standing up and singing. It was because I was the very person who was extremely afraid to do something different from others just like so many others. I was the one who knew more than anybody else the fear and consequences of sticking out. I used to be bullied. From my experiences of being bullied, I knew that I would be retaliated against if I did something different from others. It means if I said or did something out of the norm, people would make fun of me and accuse me of spoiling the atmosphere. However sincerely I tried to speak to them, I was downtrodden each time and ignored. Experiencing this has encouraged me and helped me express my conscience. (Excerpts from a flier made by the graduating seniors on March 6); Blog "zaza"
See photo: a handout delivered in front of the high school on the day of the commencement on March 6. The student who wrote it carried out the resolution. The UN commissioner who called Japan’s criminal justice system medieval gave a talk in Tokyo on March 4. 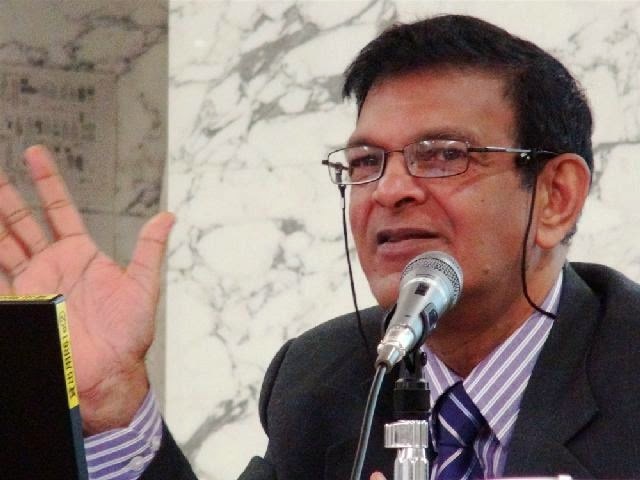 “Japan is an honorable country, which has introduced many good things to the world and became successful,” said Satyabhoosun Gupt Domah, a former judge in Mauritius. “But its only shortcoming is a problem of criminal justice such as substitute prison, overdependence upon confessions and extended detention. Even detaining for four days is said to be too long in Europe. The long detention in a substitute prison is torture. 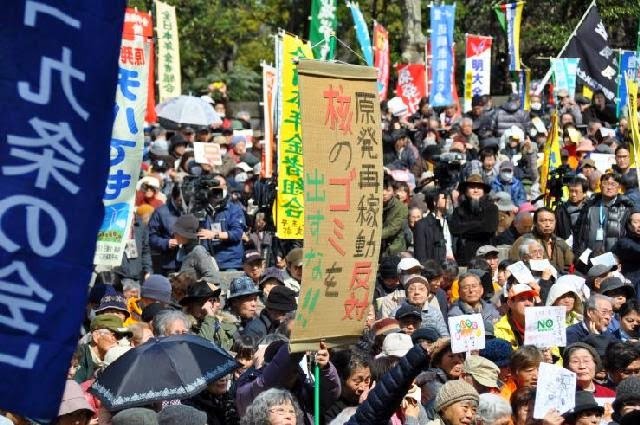 On March 8, another anti-nuke rally was held in the Kansai district, and the above action in Tokyo was followed by a subsequent one on March 15, which was joined by more than 5,000. Thus, various events were held to commemorate the third anniversary of the Fukushima disaster in all around Japan. Although the U.S.-Japan agreement stipulates that Ospreys not fly over the residential area, 318 of 517 flights have been reported as violation of the agreement during the two months since the Osprey deployment. 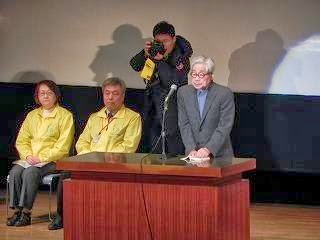 MATSUMOTO Tsuyoshi (Photo), deputy managing editor of the Ryukyu Shimpo newspaper, reported at an event called, “2.22 Rally to call for no Ospreys over Okinawa～dangerous, illegal and more burden.” Some 250 people came to the event held in Tokyo. “I don’t know how much….,” began MORI Tsuyoshi, but choked up fighting back the tears. 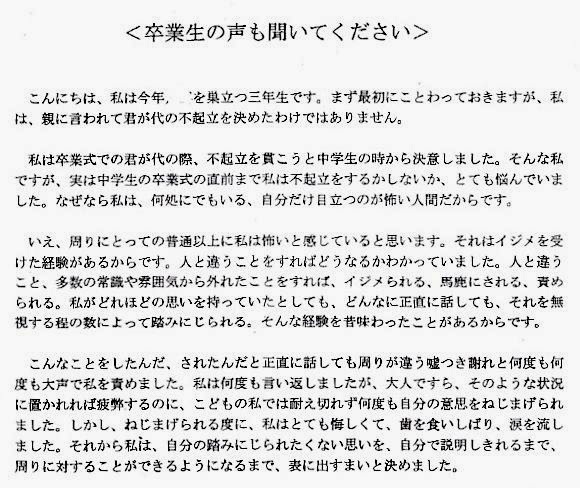 After a while, he continued, “I’m not sure how much I spoke for my daughter, who died all alone, but in court I expressed all I had in mind.” (Photo/ at the report-back meeting after the trial) The first court hearing of Watami karoshi lawsuit was held at the Tokyo District Court (TAKEDA Mitsuhiro being the presiding judge) on Feb. 17. The case was filed by the bereaved parents of MORI Mina, who committed suicide from overwork only two months after joining the Japanese pub chain Watami Co. Each of the parents made the opening statement and accused of Watami for awful working conditions. 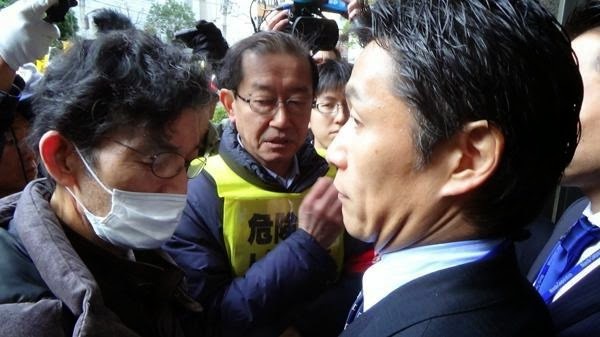 People were closely watching whether or not the defendant, WATANABE Miki, the former Watami president, would appear in the court, but on the day his attorney showed up without the defendant. Labornet TV on NHK –　Bring back the democratic NHK!